Canal Walk #1 is the most urbanized of the entire Canal system. Most of the Canal in this area is, unfortunately, located underground between Sullivan's Pond and the Dartmouth Curling Club, however, the Flume House and Cradle have been restored, and sections of Sawmill Creek put underground following damage from a hurricane in 1971 are now being “day-lighted” by Halifax Regional Municipality. Flume House and the Cradle were the main structures used to transport boats up an inclined railway, thereby connecting Halifax Harbour via a series of locks to the Shubenacadie River, and eventually to the Bay of Fundy. There is free parking available at the Telford Bridge at the foot of the Canal. There is metered parking throughout Downtown Dartmouth and at the Alderney Landing parking lot (free on weekends and after 6 pm weekdays). 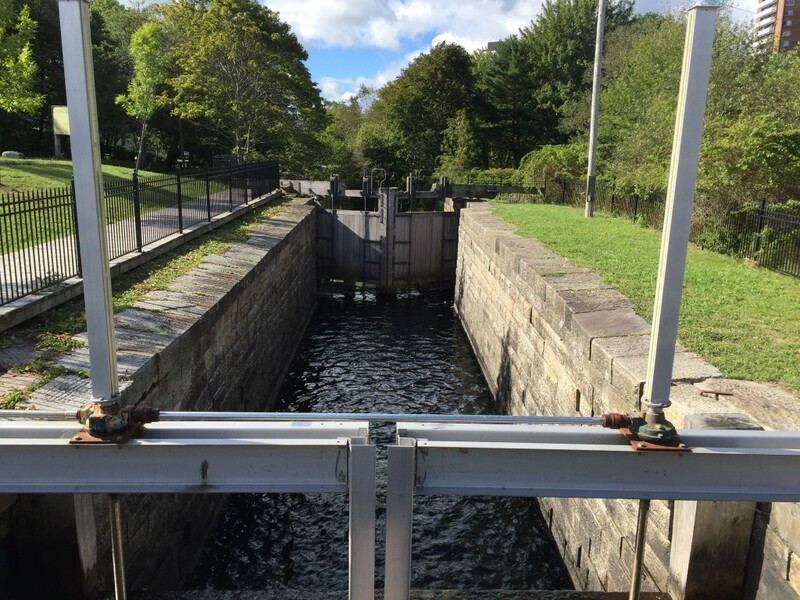 If you are interested in taking Canal Walk #1 in reverse order – going from Lock 1 to Halifax Harbour – there is also free parking at the end of Nowlan Street, off Prince Albert Rd., and along Hawthorne St. The route is accessible by foot from the Dartmouth Harbourwalk, the Dartmouth Ferry or from Downtown Dartmouth. The route described here is from the Ferry Terminal. Walk across the bridge, turn left at Canal Street and head towards St. James United Church. Alternatively, from the Telford Bridge parking lot, walk along the Canal, across the footbridge to the Dartmouth Curling Club and turn right onto Canal Street. You will be walking beside Sawmill River. ‍Read: What if you had a time machine? Crossover to Portland Street and make your way to the stone wall in front of the Church. Cross Prince Albert Rd. at the lights and turn to your right. ‍Read: Some of Us Are Up-Alongs...Some Are Down-Alongs! As you proceed along Prince Albert Rd. you will cross over to Irishtown Rd. Follow the sidewalk and cross Irishtown Rd. to the Flume House and Cradle. If you are continuing to Lock 1, which is across Hawthorne St at Sullivan's Pond, follow the trail to Ochterloney St., take the sidewalk past the Esso Station, and use the crosswalk at the Christmas Tree to Sullivan's Pond. Take the Sullivan's Pond trail past the bandstand, cross Hawthorne Street (at the crosswalk) and continue on the trail through Henry Findlay Park to Lock 1. You can return to the Ferry via Nowlan Street, Prince Albert Rd., or Ochterloney Street.